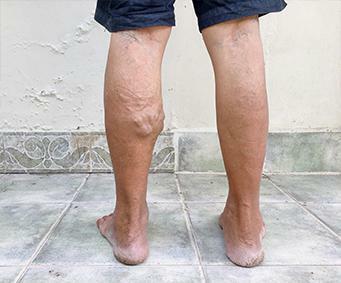 At a minimum, varicose veins are unsightly. For some, they also cause symptoms such as fatigue, pain, and swelling. In some cases, they can be a precursor to more serious health conditions such as ulcers or blood clots. Vascular surgeon, Dr. Stephen M. Barnett, at Vein Therapy of Atlanta, has over three decades of experience using the most advanced therapies to diagnose and treat varicose veins, ensuring they fade quickly and painlessly. Affecting nearly one in four Americans, varicose veins are a common condition. Risk factors include gender, family history, obesity, occupation, age and pregnancy. When the valves inside the vein stop functioning, blood flows backwards in the vein. The effect of this backflow, or reflux, is to allow too much blood within the vein, thereby increasing the pressure within the vein. The body's response to this is to enlarge the vein to accommodate the extra blood and help decrease the venous pressure. In addition, secondary veins may develop to further this effort. These secondary veins are commonly called varicose veins. They may appear as enlarged and tortuous bulging veins on the skin surface, visibly enlarged bluish veins, or spider veins. The first step in treating varicose veins is to treat their source. How do I know if I have varicose veins? Whether you want to treat your varicose veins to relieve the discomfort and fatigue they cause, or for aesthetic reasons, Dr. Barnett offers a variety of treatment options. He starts with a personal consultation and a diagnostic ultrasound. Then, he develops an individualized treatment plan to help eliminate the appearance and symptoms of your varicose veins. For more information about varicose vein treatment, call Vein Therapy of Atlanta.